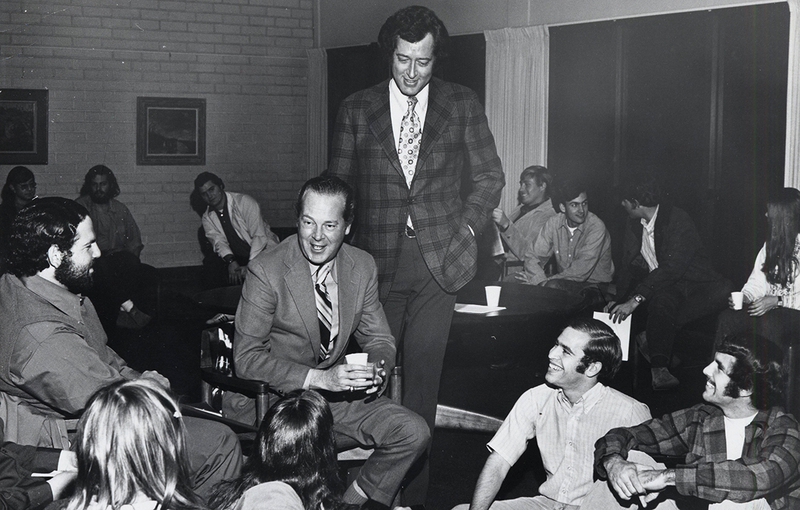 Michael Riley, professor of film and literature, stands behind Academy Award-winning director Delbert Mann during a meeting with students in this 1971 photo from the Claremont Colleges Archive. “I think what got me the Ath job, frankly, is that Jack decided that if I could get all these people (to my film classes) without paying them a dime — having no budget at all — then maybe I was the guy to run the Ath,” joked Riley in a 2001 interview with the College. Riley created the inaugural Athenaeum program that featured Holocaust survivor and author Elie Wiesel, author-historian Daniel Boorstin, former Presidential candidate John Anderson, film and television director Delbert Mann, and author Anne Rice. From hiring student associates to help with programming — a precursor to today’s Athenaeum Fellows — to dining at a head table with fine cutlery and linens, Riley shaped CMC’s campus culture for generations. Riley’s most well-known course was Film and the Novel, which became a core requirement for a bachelor’s degree in film criticism in partnership with Pitzer College. The class compared novels and their film adaptations. Gradually, it evolved into a deeper exploration of film narrative with selections like Joseph Losey’s The Go-Between, Francis Ford Coppola’s The Conversation, and Nicolas Roeg’s Don’t Look Now. Together with James Palmer, Riley authored a scholarly study of Losey entitled The Films of Joseph Losey in 1993. A few years later, Riley published a candid dialogue called Conversations with Anne Rice: An Intimate, Enlightening Portrait of Her Life and Work. Riley brought the Interview with the Vampire author to CMC before she became a literary star. “When I first met him, I could tell immediately that Mike was one of the smartest people I’d ever met,” said Peter Otte ’85, a literature major who served as one of the first Athenaeum associates under Riley. “I would come into his office with a question, sit down, and struggle just to keep up with the way his mind moved from idea to idea. Riley was born on July 12, 1935, in Dallas, Texas. He served as a Supply Captain in the Air Force from 1956 to 1959 and earned his Bachelor of Arts in Finance from Southern Methodist University. It wasn’t until he moved to California, however, that he found his intellectual calling — history and literature, particularly the works of Charles Dickens. Riley graduated from Claremont Graduate School in 1968, and that same year, began his teaching career at Cal State Fullerton and as an assistant professor in the literature department at Claremont Men’s College. He became a full professor of film and literature at CMC in 1992. Through his teaching, Riley inspired countless film and literature aficionados who would go on to careers in entertainment. An understated part of his campus legacy, Otte and Stark said, is how he mentored gay students. Riley, who was openly gay for most of his CMC tenure, guided undergraduates during an era when being truthful about one’s sexuality could have serious consequences. “He helped a lot of students through some really difficult times,” Otte said. Riley retired from teaching in 2001 and lived in Pasadena and Dallas before moving to San Diego, where he died. He was buried at Oak Park Cemetery in Claremont. A tea at the Athenaeum will be held during 2019 Alumni Weekend in Riley’s honor. Details are forthcoming.